Right now I am in Saumur for a two-day festival called Les Grands Tablées du Saumur-Champigny. Last time I was in Saumur, the constant rain kiboshed our plans to ride bicycles through the vineyards. That was the dream, anyway: a little exercise to go with the wine drinking. We did try. But the rain put a stop it – worst luck – and we ended up staying inside the local restaurants instead, drinking the 2014 vintage and tasting the local cheeses. 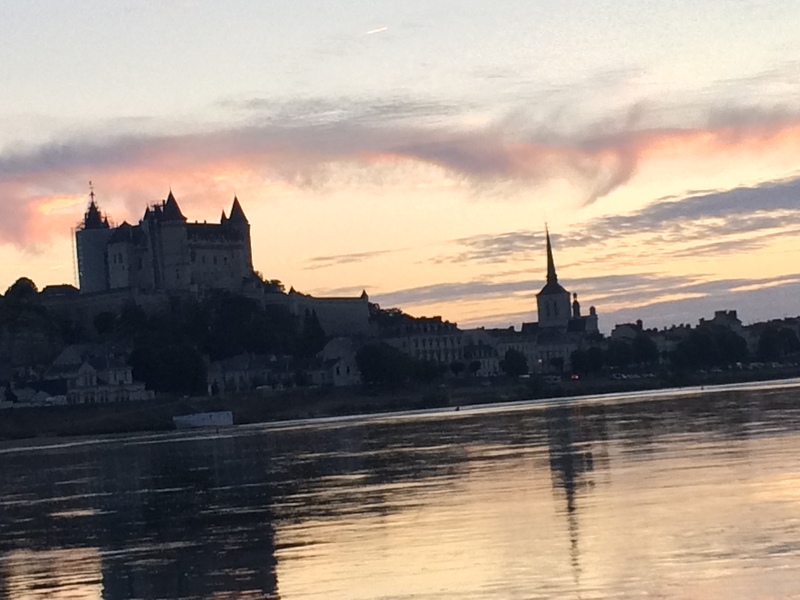 Now I developed a serious taste for this refreshing red that is – pound for pound – one of the most versatile red wines out there, I am happy to be back in Saumur again to finally meet the winemakers and see the vineyards. 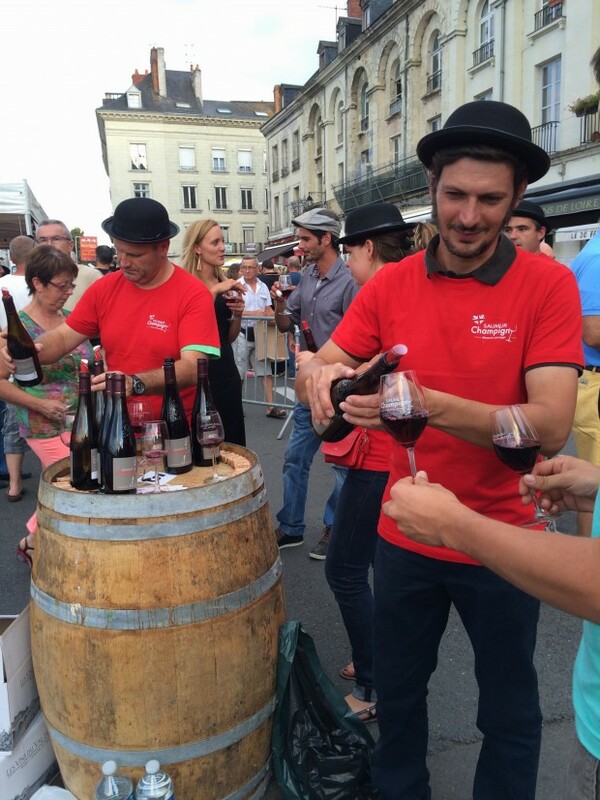 The 2014 vintage is an exciting moment for Cabernet Franc in Saumur-Champigny. It’s worth celebrating, especially if it is pouring all night long. This year the event had a British theme (there were a lot of “British” bowler hats, which only made me look like droog A Clockwork Orange. Or maybe Mel and Kim). Was it just a gimmick? There is a deep connection with Britain in the area – this is where Eleanor of Aquitaine, Queen of England and France in the 12th Century was buried, next to King Henri II, in Fontevraud Abbey. 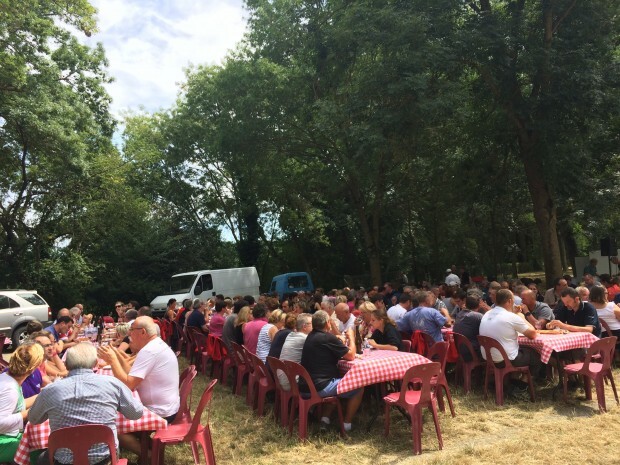 On a less serious note, after having talked to the locals and hearing the fun they had with other cuisines in previous years – last year’s theme was Belgian – it seems to me, more important for them to have fun with the local ingredients. The event is run by local volunteers: this year, they made an impressive 6000 fruit crumbles and 6000 mushroom pies for 10,000 ticket holders. Fifteen years ago, Les Grands Tablées started as a simple party after the winemakers put on a tasting for the town. Today it is not only a showcase for the local food and wine, but also for the town to have a big party before the August holidays. 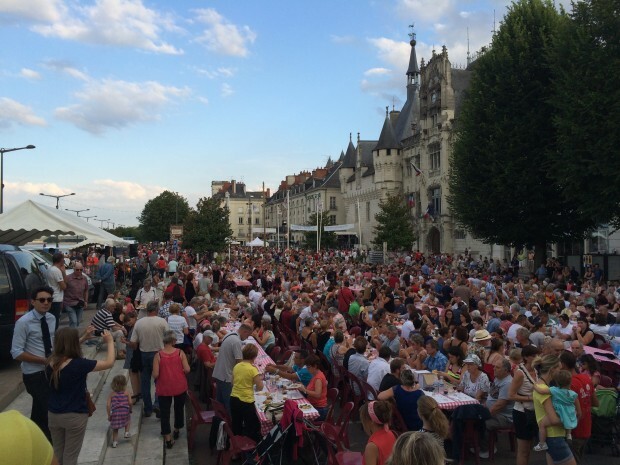 Having spent the last couple of days with the volunteers and the winemakers, it is the sense of community in Saumur that shines through. 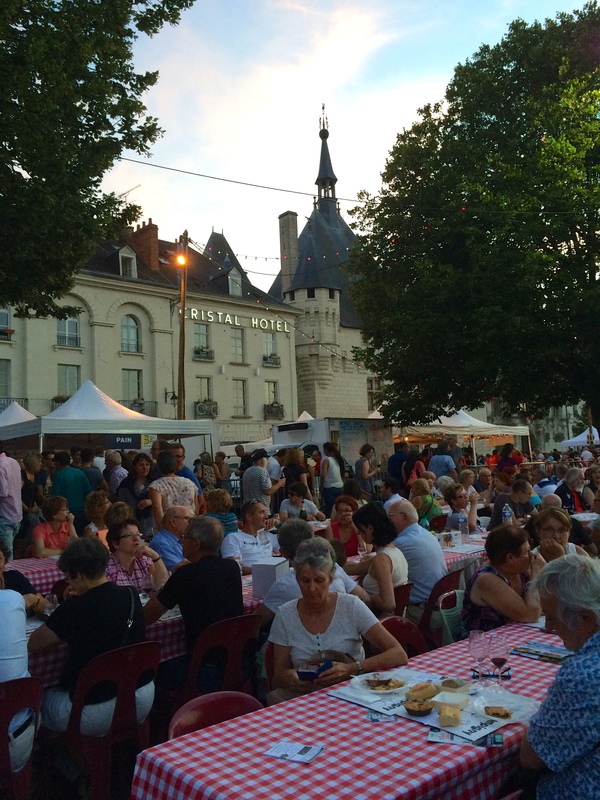 Whatever the cuisine is next year, it’s worth a visit to this local festival – the wines of the Loire are made for summer drinking. The wine for the event, the Cuvée des 100 Vignerons, is made by 100 local growers contributing 15 kilograms of Saumur-Champigny each. Happily, the 2014 vintage is very good. 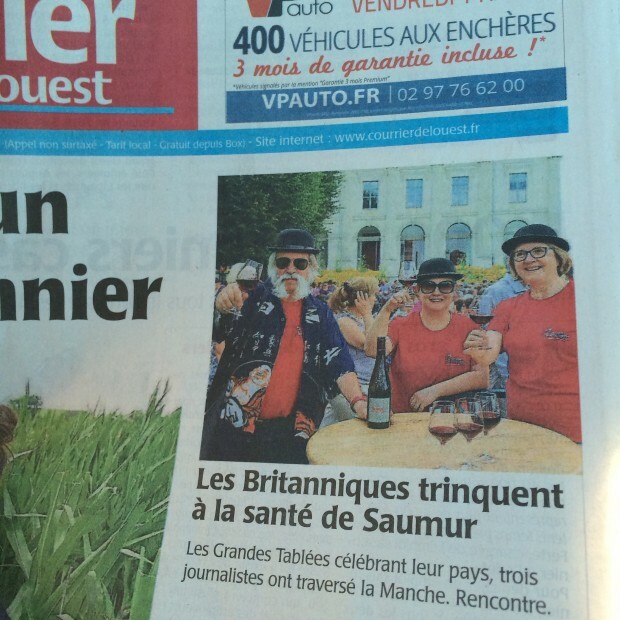 This morning, I found Jim Budd, Christine Austin from The Yorkshire Post and myself on the front page of the local newspaper toasting a glass of the Cuvée des 100 Vignerons to Saumur. It was a great summer night. Many thanks to the winemakers of Saumur-Champigny for the hospitality, InterLoire and Sopexa. 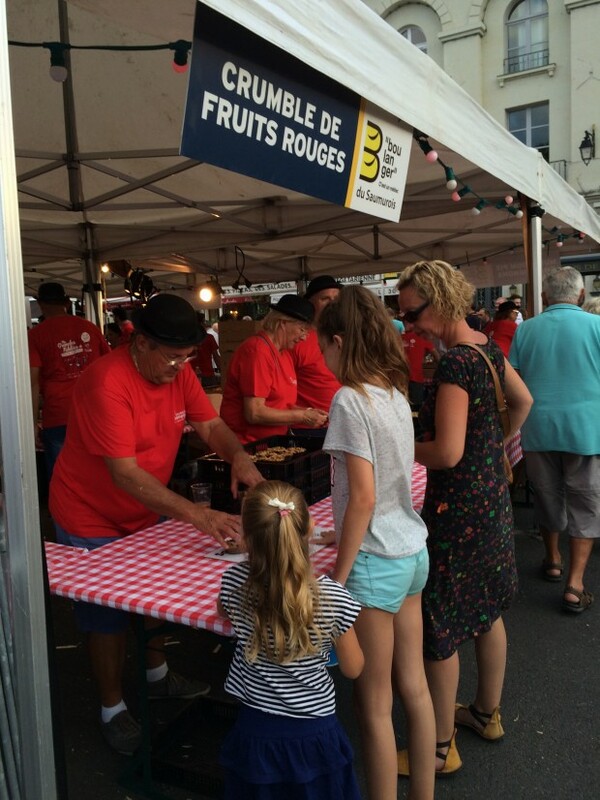 For more details: Les Grands Tablées du Saumur-Champigny. 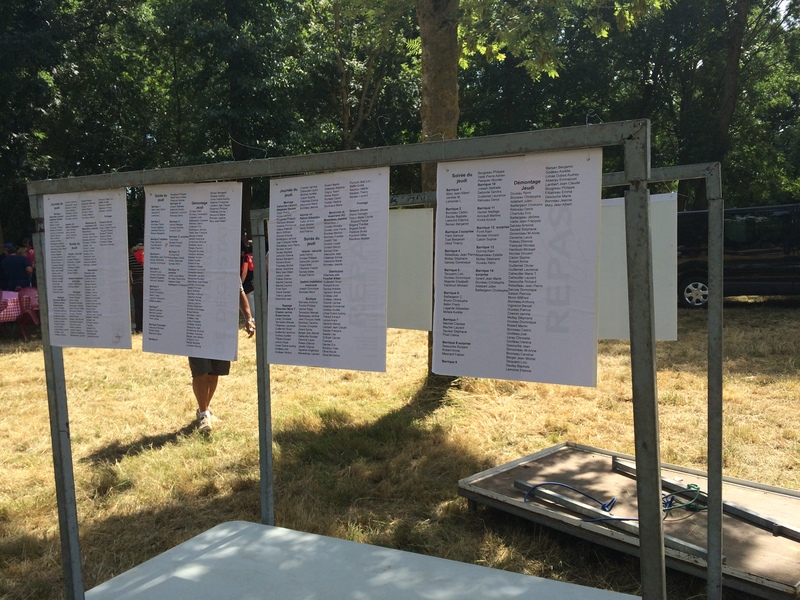 And for more excellent photography of the Les Grands Tablées festival, see Jim’s Loire blog. The next post: 3 terroirs from Saumur-Champigny you need to know.